iFonebox special offer for children's day is available! 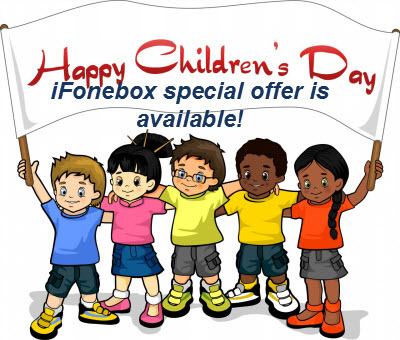 iFonebox special offer for children’s day is available! Have you ever started to think about how to celebrate children’s day with your sweetheart, as children’s day is just around the corner? One thing I am sure is that iPhone is indispensable tool to record the precious moments. As iPhone had become the most popular mobile phone around the globe, more and more children have access to this smart iPhone. So you need to be very careful about the possibilities of data being deleted by mistake by your 5 years old naughty boy. As professional IOS data recovery software, iFonebox understand your worries about losing iPhone data accidently while enjoying celebrating children’s day with your family and therefore provides special offer for the coming children’s day. To cater to Mac OS users, we have adjust the price of Mac Version from $49.95 down to $45.95. People who boasts a series of Apple products, they can enjoy transferring iPhone data from iPhone to Mac computer for backup freely. As specialized iOS recovery application, iFonebox is currently capable of recovering lost or deleted Contacts, Notes, Camera Roll, Photo Stream, Messages, Message Attachments, Call History, Calendar, Reminders, Voice Memos, WhatsApp and Safari Bookmark from iOS devices including iPhone, iPad and iPod Touch as well as from iTunes/iCloud backup files. With this powerful iFonebox, you can steer clear of trouble of accidental data loss. People may argue that they can restore lost data from iTunes/iCloud backup file, so why I have to pay for this specialized iOS data recovery software. Well, exactly, you can restore your iPhone data from iTunes backup file, but you cannot selectively recover certain data, which means you can never restore part of the iTunes backup file, which always cause data overriding and erasing. iFonebox can do much better in selectively restoring certain data like Contacts or notes than iTunes does. Besides, after exporting certain data like contacts from your iPhone, you can choose and device whatever you want to recover and do modifications before recovering. Conclusively, there are three reasons for why you have to have this powerful iFonebox. First, iFonebox can export and recover data note only from iTunes/iCloud backup file but also from iOS devices including iPhone, iPad and iPod Touch. Second, you can selectively recover certain data or create additional backup for certain data such as Contacts, Notes, Camera Roll, Photo Stream, Messages, Message Attachments and Photos etc. Third, to celebrate the coming Children’s Day, Auntec is providing special offer for iFonebox. So, iFonebox is the best accompany tool for your iPhone to safeguard your iPhone data. In addition, with iFonebox, you don’t need to worry about your iPhone data being deleted by your children any more.